There’s something very pleasing about an open-faced sandwich a.k.a. bruschetta in Italy, tartine in France, or smørrebrød in Scandinavia. The filling becomes the topping, which is a lovely reflection of the sum of its parts and a visual tease, beckoning a bite. It begins with day old bread which gets a revitalizing browning on the grill. From there you can get as creative as you like. This rendition includes fresh ricotta, roasted beets and a generous smear of a garden pesto I made with parsley and mint. Place the parsley, mint, and garlic in the bowl of a food processor. Process until finely chopped. With the motor running add the 1/2 cup oil in a steady stream until blended. If too thick, add extra oil to your desired consistency. Season with salt and pepper. Heat the oven broiler or a grill. Brush the bread slices with oil. Broil or grill until toasted golden on both sides but still tender in the center. Remove and cool the bread for 5 minutes. Smear the ricotta on the bread, then drizzle some of the pesto over the ricotta. Top with beets. 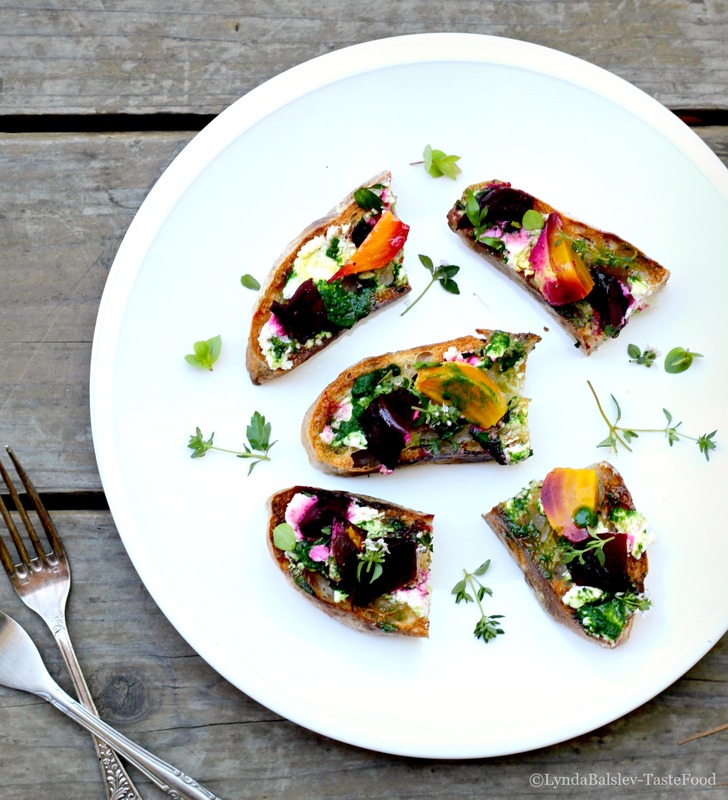 Brush the beets with a little oil and season the bruschetta with salt and pepper. Garnish with fresh oregano and thyme flowers. Serve whole or cut in half for smaller bites. When you switch out the rice with farro in this risotto-style dish, you end up with farrotto. Like rice, the farro grains steep and simmer in stock, but without the nonstop requirement of stirring with rice. 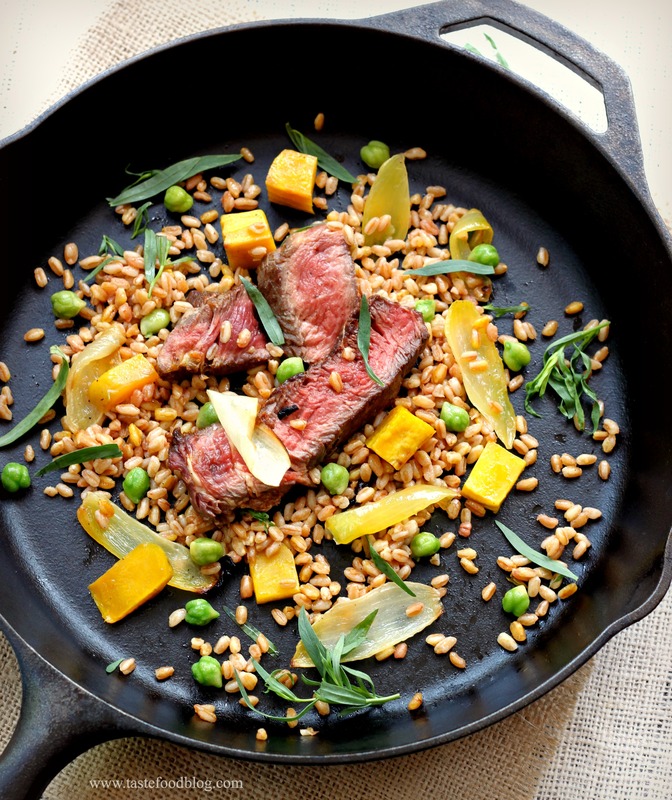 The difference is that farro has a hearty chewy texture, never succumbing to mushiness. Each nutty whole wheat grain maintains its shape, exuding earthy wholesomeness. You can’t help but feel healthy when you eat it. 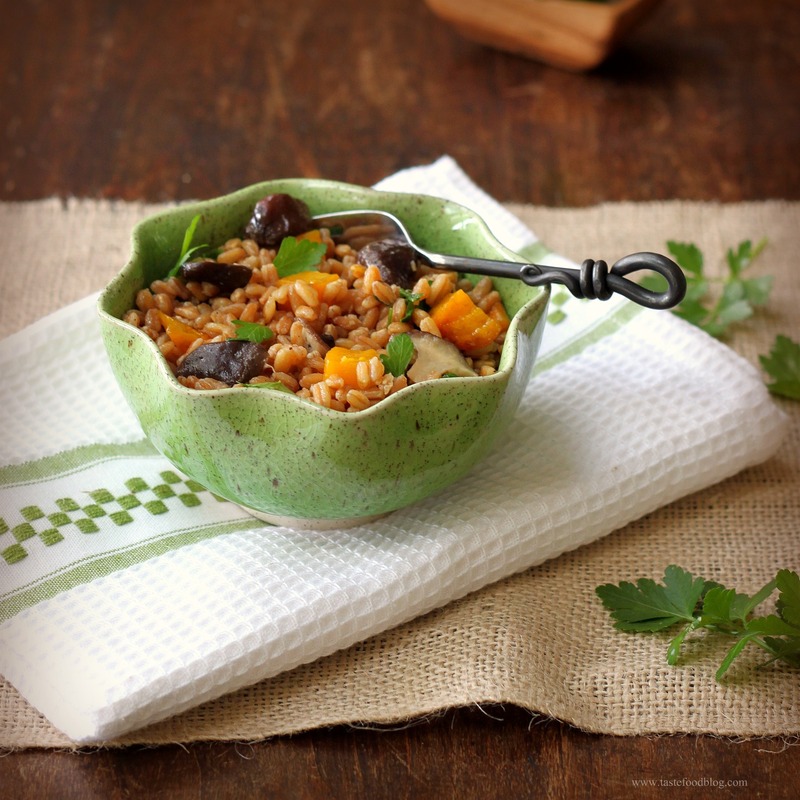 Farro has an ancient pedigree, originating in the Mediterranean and the Middle East. Also known as emmer, and compared to spelt, farro is a species of wheat, high in fiber and rich in protein and B vitamins. It’s delicious in salads, pilafs, breads, soups and stews. If you haven’t tried it, you should. 1. Melt the butter with 1 tablespoon olive oil in a large saucepan over medium heat. Add the shallot and sauté until softened, about 2 minutes. Add the mushrooms, lightly season with salt, and cook until they begin to soften and release their juices, 3 to 4 minutes, stirring constantly. Add the garlic and thyme and sauté until fragrant, about 30 seconds. Add the farro and cook until slightly toasted, about 2 minutes, stirring constantly. Pour in the wine and stir until absorbed. Add the stock and 1/2 teaspoon salt and bring to a boil. Reduce the heat to low and cover the pot. Simmer until the farro is tender and the liquid has been absorbed, 30 to 40 minutes. 2. 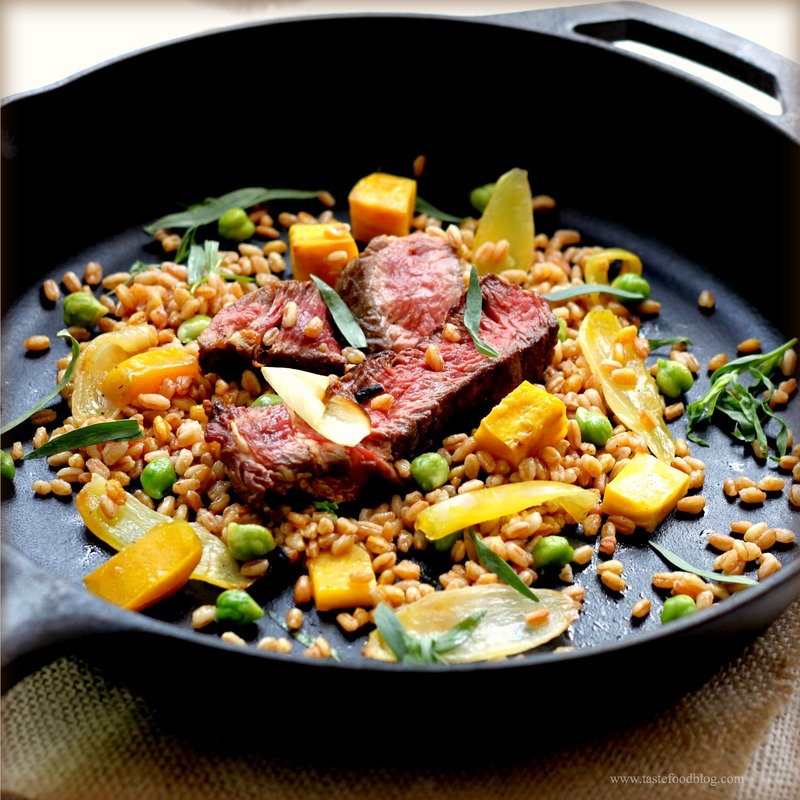 While the farro is cooking, heat the oven to 400°F. Toss the beets, 1 tablespoon oil, and 1/4 teaspoon salt in a bowl. Spread on a small rimmed baking sheet or baking pan and roast in the oven until the beets are tender and golden brown in spots, about 20 minutes. 3. When the farro is ready, stir in the beets, parsley, and black pepper. Serve garnished with additional parsley and crumbled fresh goat cheese, if using. It took a good long while for me to reconcile with the flavor of beets. I gazed at them from the sidelines, attracted to their vibrant hues, aware of their nutrient-rich flesh, yet wary of their earthy notes. As a cook, I wished to like beets, and as a parent, I wanted to serve them – so I willed myself to eat beets until I learned to love them. At first, I took baby steps. I nibbled small bites. I doused them with citrus to offset their earthiness. I grew bolder and roasted beets in olive oil, discovering that fire and char nicely counteract their dirt-like flavor. My go-to beet became the golden variety, which is pleasantly mild and nutty. And, eventually, I succeeded. Now, I am a beet convert. Yet while I no longer shudder at eating a completely naked beet, I continue to craft recipes that embrace the sweet beet while tempering their earthy nature. This gratin recipe allows beets to shine amidst a minimal cast of characters. The co-stars of the dish happen to have their own strength and assertiveness, helping to tone down any earthy qualities that might be lurking in each bite. Layers of beets are cloaked in sour cream infused with orange zest and thyme. Gruyère cheese ripples throughout, adding a complementary nuttiness. The beets release their juices while cooking, saturating the gratin with spectacular color and all the flavors meld together. When I made this, it was so good, everyone at the table was reaching for seconds. As a cook, parent and beet convert, I find that a very good thing. I prepared this recipe in individual ramekins with a variety of red, golden and chioggia beets. 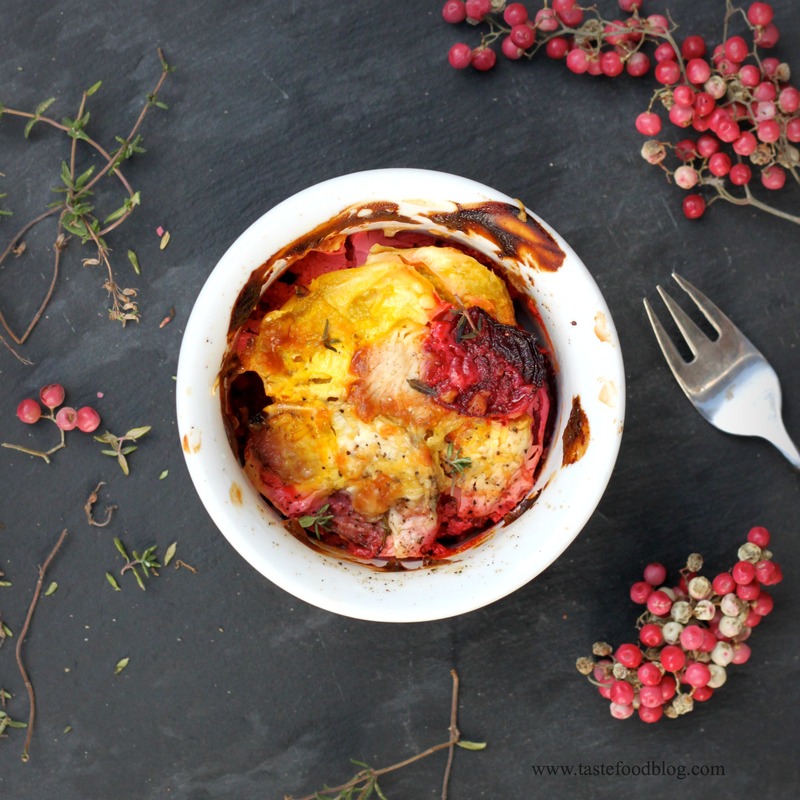 A gratin dish will also work for family style serving. Feel free to mix and match the beets to your taste. Eight large beets may be substituted for the baby beets, but be sure to peel the skin. Preheat the oven to 375°F (190°C). Butter 8 (6-ounce) ramekins or an 8 by 8-inch square gratin dish. Whisk the sour cream, garlic, orange zest, 1/2 teaspoon salt, and 1/2 teaspoon black pepper in a bowl. Thinly slice the beets with a mandolin or knife. Arrange 1/3 of the beets, slightly overlapping in the baking dish or individual ramekins. Spoon 1/3 of the sour cream over the beets, carefully spreading to cover. Sprinkle 1/3 of the cheese over the top. Lightly season with salt, pepper, and pinch of fresh thyme. Repeat with two more layers. Bake in the oven until the beets are tender and the gratin is bubbly and golden, about 45 minutes. Serve warm or at room temperature. I am a converted beet lover. It took a good long time for me to reconcile with their earthy taste. 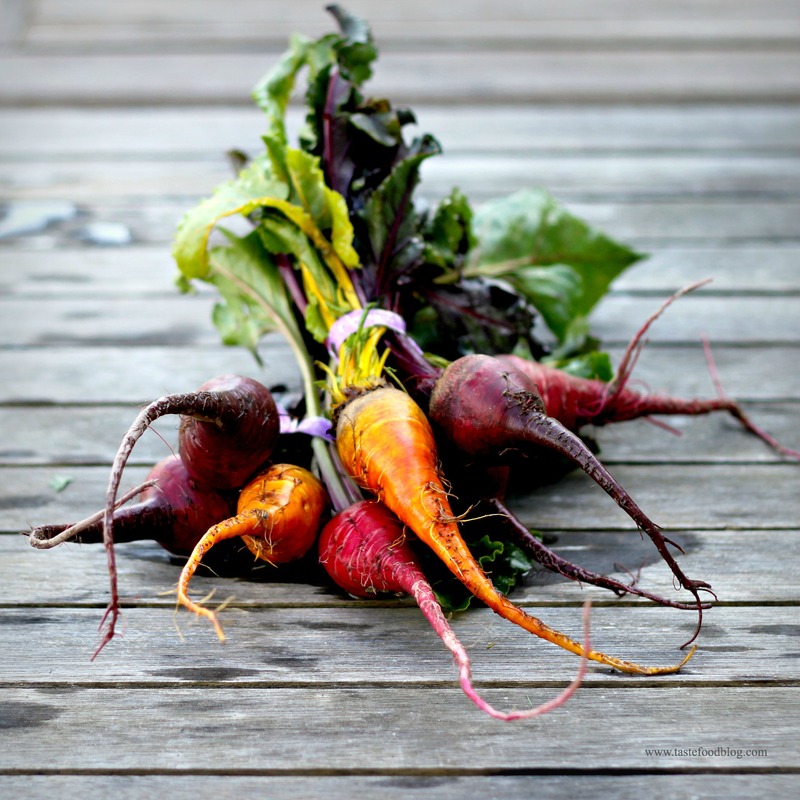 I gazed at beets from the sidelines, attracted to their vibrant magenta and ochre hues, aware of their nutrient-rich flesh, yet I shuddered at their earthy flavor. As a cook, I wanted to love them. As a parent, I wanted to serve them. So, I willed myself to eat beets until I learned to appreciate them. At first, I took baby steps. I nibbled small bites. I dressed them with citrus which tamed their earthiness. I grew bolder and roasted beets in olive oil, discovering that fire and char nicely balanced their robust flavor. My go-to beet became the golden variety, which is pleasantly mild and nuttier than its assertive red cousin. And, eventually, I succeeded. Now, I am a card carrying beet lover, frequently offering them at our dinner table. I serve them roasted with meats, sauteed and tumbled with farro, gratineed or in salads. This recipe is one of my family’s favorites. The beets marinate in their roasting oil with lemon juice, which is also used to dress the salad. Preheat oven to 400 F. (200 C.) Place beets in a baking dish. Pour oil over the beets. Sprinkle with salt and pepper. Cover dish tightly with foil. Roast the beets until tender, about 1 hour. Remove beets from baking dish and transfer to a plate to cool. Pour cooking oil into a small bowl and reserve. When the beets are cool enough to handle, peel and discard the skin. Cut the beets in 1-inch chunks and place in a large bowl. Add lemon juice and vinegar to the reserved oil. Whisk to combine and taste for seasoning. Pour dressing over the beets and gently toss to combine. Cover and refrigerate beets for at least 2 hours or overnight. To serve, place the arugula in a large bowl. Drizzle some of the marinade over the arugula and toss to combine. Divide among serving plates. Spoon beets into center of the greens. Sprinkle with goat cheese, pistachios, mint and chives. Drizzle with additional dressing to taste. I used to hate beets. Now I can’t get enough of them. Perhaps I am scrambling to make up for all of those lost beet-eating years when I shuddered at the thought of tasting the earthy beet. Now that I am a covert, I always have a bunch of beets in my refrigerator, ready to accompany a roasting chicken or stir into a couscous or rice pilaf. Beets’ murky sweetness also adds a fresh foil to grains and salads, working especially well when matched with other strong flavors like bitter greens or tangy citrus. In this recipe they team up with healthy wheat berries and a mix of peppery, sharp greens. 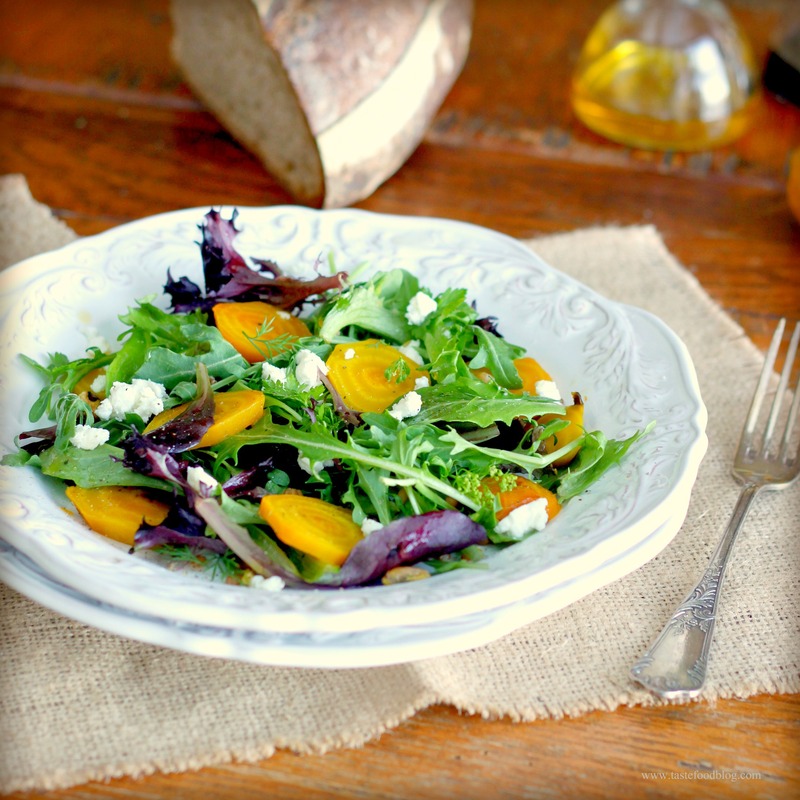 A shower of chervil adds a complementary anise note to this wintry salad. Don’t discard the pan juices from the roasted beets in olive oil. Once cool it makes a lovely dressing for the beets. Serves 4. Preheat oven to 400 F. Trim ends of beets and scrub clean; throughly dry. 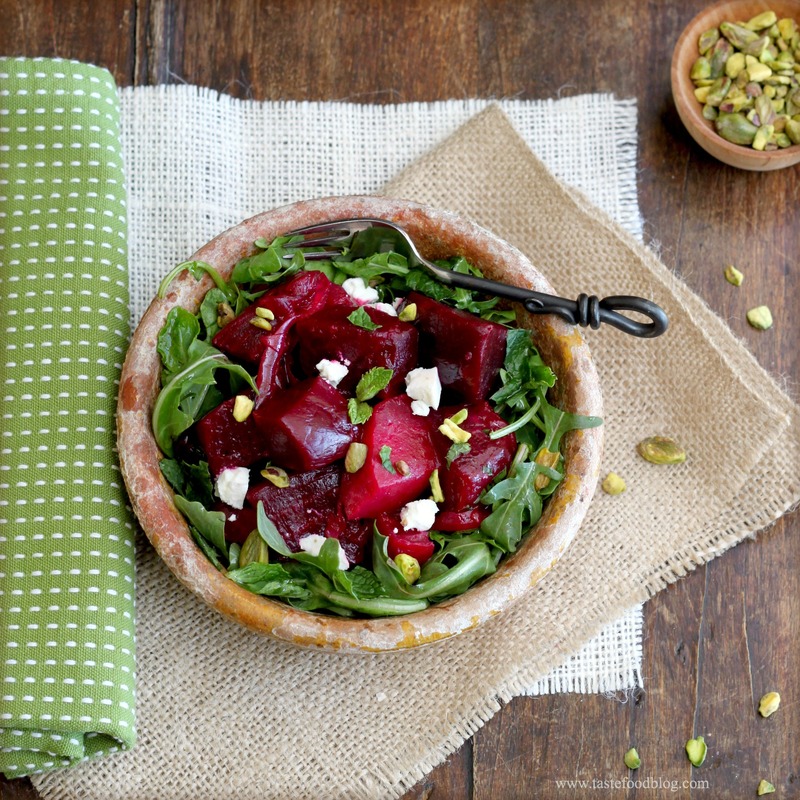 Place beets in an oven-proof rimmed pan or pot with a lid. Add 2 tablespoons olive oil and toss to coat. Cover pot with lid or aluminum foil. Bake until beets are tender but not too soft, 50 minutes – 1 hour. Remove from oven. Transfer beets to a cutting board and cool. Reserve cooking liquid in pot. When beets are cool enough to handle, peel away skins. Slice 1/4 inch thick and place in a bowl. Whisk 2 tablespoons lemon juice and salt into reserved beet juice. Drizzle the beet juice over the beets and gently toss to coat. Arrange greens on a serving plate. Sprinkle wheat berries over the greens and arrange beets over the salad. Scatter with chervil and sprinkle goat cheese over the salad. Drizzle any remaining beet juice over the greens. Squeeze the juice of 1/2 lemon over the salad, to taste. Sprinkle with salt and freshly ground black pepper.